Once per turn: You can Special Summon Rank 9 or lower "Number" monsters with 3000 or less ATK that have different Ranks from each other from your Extra Deck, up to the number of Xyz Materials with different names attached to this card, but their effects are negated, then detach 1 Xyz Material from this card. For the rest of this turn, unless this effect was negated, you cannot Special Summon, and any battle damage your opponent takes becomes halved. While you control another "Number" Xyz Monster, this card cannot be destroyed by battle or card effects. This is the first member of the Utopia archetype to not have 39 as its number, instead being 39 reversed. It is also the first Utopia monster not to be used by Yuma Tsukumo, instead being used solely by Astral. This card can be considered the Utopia and manga counterpart to Number 99: Utopic Dragon. This card is the first Rank 12 monster to be released in the OCG/TCG. While not explicitly stated, this card is presumably the transformed form of Kyoji Yagumo's Number 77: The Seven Sins, since this card's wings resemble Number 77's legs. this makes sense, since the other two numbers that Kyoji gave to Yuma, Kite, and Shark underwent similar transformations. This can be further supported by the fact that both monsters share a rank. This card's Summoning condition is similar to Number F0: Utopic Future and Number S0: Utopic ZEXAL. All three monsters can only be Xyz Summoned by using Xyz Monsters with the same Rank. Strangely, and unlike Number F0 and Number S0, this card does not obey the rule that all Xyz Monsters must have a Rank equal to the Levels of their usual Xyz Materials. 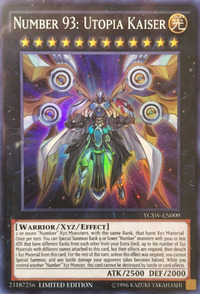 All three monsters mentioned use Xyz Materials that lack Levels entirely, thus Number F0 and Number S0 have a Rank of 0, but this card uniquely has a Rank of 12 while never using or mentioning Level 12 monsters at all in its Summoning condition. This card's OCG/TCG artwork is taken from Yu-Gi-Oh! ZEXAL Rank 54: The True King of Numbers! !, specifically from the panel showing this monster being Summoned. This monster appears in the artwork of Commitment to Tomorrow.